After HUNGRY GHOST RITUAL (YU LAN SUN GUNG) and KEEPER OF DARKNESS (TOR DEI KUI MOR YUN), Nick Cheung Ka Fai directed again with THE TROUGH (DAI NGAK CHO). Earlier he appeared on a Fantastic TV program. Although Ka Fai already directed for a third time, he was making his writing debut. "Crime, drama and action are all Hong Kong film strong suits, among them undercover is a subject that Hong Kong especially likes. I also have a preference for it." He revealed that the film had many large scale car chase and gun fight, as he believed that it would able to please the audience. Speaking of the always righteous Xu Jinglei playing the villain, Ka Fai stated that he wanted to turn actors' past image upside down and to be able to give the audience a fresh new look. He even revealed that an actor quit, but he felt that was normal. As for awards, he stated that he had no ambition. He only wanted to do his best. The Louis Koo Tin Lok, Francis Ng Chun Yu and Kristal Tin Yui Nei starred fantasy drama SHED SKIN PAPA (TUET PEI BA BA) will open in Hong Kong on the 10th. The film was adapted from an award winning play of the same name. Two Best Actors Chun Yu and Goo Jai played father and son for the first time as he led the audience with their excellent acting into a sincerely moving "life in reverse". Goo Jai played a film director who was down in love and career. At the rock bottom of his life, his father with dementia strangely shed skin everyday. After each shed he would be a decade or so younger, as the father and son grew closer in age he through his father's experience rearranged his life direction. In one particularly memorable moment, the father at six different age sat around a table and had noodles, argue, and ridiculed himself at different time and space -- a great test for Chun Yu's acting. 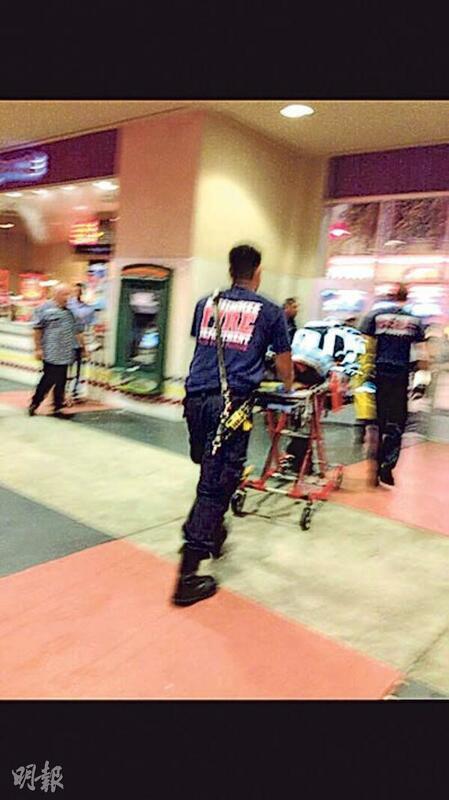 Someone fainted from watching AVENGERS: INFINITY WAR in the U.S.
Chapman To Mak Chak earlier flew to Udine, Italy for its 20th Far East Film Festival. His film held its European premiere during the film festival. Ah Jat said in fluent English, "Thank you to everyone who has appeared in my life, because everyone more or less has inspired and influenced me. This film is about failure and giving up. I often failed but never gave up, often I would successfully stand back up!" The film finally won the MYmovies Award. The Nick Cheung Ka Fai directed action film THE TROUGH (DAI NGAK CHO) will open on the 3rd in Hong Kong. Two days ago Ka Fai along with stars Lam Suet and Maggie Cheung Ho Yee to continue to promote the film in Guangzhou and meet with viewers. After the screenings viewers said that Ka Fai was the director and actor with "the most breakthrough spirit". Ka Fai said, "A sense of success from being loyal to my own preference!" Earlier the 56 year old Francis Ng Chun Yu got into shape for his new film and wowed many crew members when he removed his clothes to show off his "new body". Chun Yu boasted that he was born big. "Actually when I was born I already had pecs, abs and tris, I have anything and everything!" However after he spoke he could not help but laugh himself. Chun Yu worked out on machines until he was exhausted and drenched the floor with sweat from doing sit-ups. He stated, "Often when I got very tired, I would play basketball or box, I had to keep training." However Chun Yu did not have any special diet. He admitted that he did not want to get too big. "Now I can scratch my back. If I get too big I wouldn't be able to!" Although the film is already done, Chun Yu stated that he would keep training because he wanted to protect his family. "Now the world has too much negative energy, you would see that on trains, planes and automobiles. We like to travel as a family, men really have to train more to protect their families!" The Derek Chiu Sung Kei directed film NO. 1 CHUNG YING STREET after winning an award at last month's Osaka Asian Film Festival recently was selected for the 20th Udine Far East Film Festival. Two nights ago it held its European premiere and received a 5 minute standing ovation from the film festival chair, film critics and viewers. Chiu Sung Kei was moved to tears. Hong Kong filmmaker Sylvia Chang and many university students after the screening had an exchange with the director. She praised Chiu Sung Kei as a daring and fearless director. Louis Koo Tin Lok earlier won his first Hong Kong Film Award Best Actor. Two nights ago he finally was able to take time to celebrate at his restaurant. He also invited two fellow winners Best Supporting Actor Philip Keung Ho Man and Best New Performer Ling Man Lung. 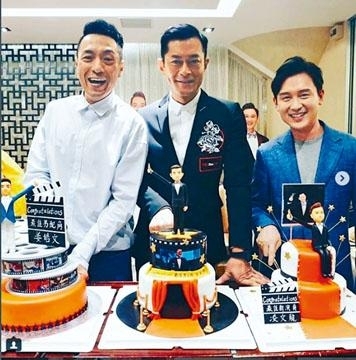 Goo Jai shared photos online and even arranged for the trio to cut a cake together. Friends like Gordon Lam Ka Tung and Lo Hoi Pang were also present. He even described the evening as the "Best Celebration Banquet". Ling Man Lung also posted photos from the celebration and even thanked Goo Jai. "What a pretty cake! I am very happy! I never thought that I would get a cake. Thank you Mr. Koo, Thank you One Cool Film." The film WHEN SUN MEETS MOON (MAU YUT MAU YUET) was selected as the closing film for England's East Winds Film Festival. Director Benny Lau Wai Heng was greatly pleased. "When I first made becoming a director my goal, I not only wanted to make subjects that I liked but also hoped to be able to exchange and share ideas with filmmakers of different places. This time WHEN SUN MEETS MOON received the attention and recognition from England's East Winds Film Festival, I feel deeply honored. It's a big shot of confidence before the film's release." Lead actress Kathy Yuen (Tong Yi) in WHEN SUN MEETS MOON opened the eyes of many with her refreshing student look. Her emotional performance in the film already captured fans' hearts during its Beijing screenings. Kathy admitted, "For my first female lead role, everyday at work was very stressful. In order to completely enter the character, didn't have much expression on the set. The crew couldn't help but ask all day, 'Are you upset?'" In order to ease the tension, Benny tried everything to cheer Kathy up. However things never went the way he wanted. "I am the master of harmony, as I hope everyone would be happy. I remember when we shot the mother and daughter argument scene at the Wah Fu Estate, Kathy completely ignored everyone. I couldn't help but ask, 'Did we do something to upset you?'" Kathy said, "That day Maggie (Siu Mei Kei) ignored me. When the director asked me this question, my tears were about to flood out because Maggie's acting was truly great!" Playing Kathy's Mommy, Maggie often saw her "daughter" reading the script alone. She felt that this was a required stage for new comers with their first lead. "Just like I was before, many people thought I was very cool. I only knew to bury my head in the script and read because keeping my mind on my own script truly was very important!" In the face of an elder like Maggie, Kathy at first was a little afraid and did not dare to take the initiative to chat with her. Maggie understood that very well. "When I was still new, I saw (Anita) Mui Yim Fong at the television station. Even though we weren't working on a series together, I would be just as scared too." As they became familiar, Maggie urged Kathy to let go and not let the stress strangle her. "I told her, making a movie should be a pleasure. She should cherish her time with the team, that type of relationship was the happiest!" Maggie unconditionally taught her a valuable lesson, which Kathy sincerely appreciated. "Maggie was right, there was a lot that truly needed to overcome. I have to be strong and take my first step!" At the end of the shoot, the mother and the daughter were reluctant to part. "Thus, during the promotional period I was very happy to be able to see 'Mommy' again!" Kathy said. Sam Chan Yu Sam, Nathan Ngai Chun Ho, Wang Lidan yesterday attended the film TUNG GUNG SUN (BORN FROM THE SAME ROOT), a story about sea gypsies. Chan Yu Sam was the executive producer and the actor, playing a couple with Wang Lidan in the film. He said that this was already his second time as a producer. He has always wanted to participate in behind the scene work. He did not have enough experience before, so he learned as he worked. In the future he would develop toward producing, directing and acting. Would he work with his father Shek Sau? He said that Dad has asked why he never asked him to play a role, but so far he still has no suitable role for him. Chan Yu Sam last year wed. He and his wife wanted to enjoy time as a couple first. His parents has not given them any pressure, but they planned to have children next year. Now he is busy making milk money. Playing a corrupt cop in LINE WALKER 2, Ngai Chun Ho revealed that he has left TVB for movies. After 10 years at TVB he wanted to make different attempts. Now he is a free agent. Did he feel that his opportunities at TVB were limited? He only wanted to make more new attempts. The film AVENGERS: INFINITY WAR yesterday had a strong opening in Hong Kong. 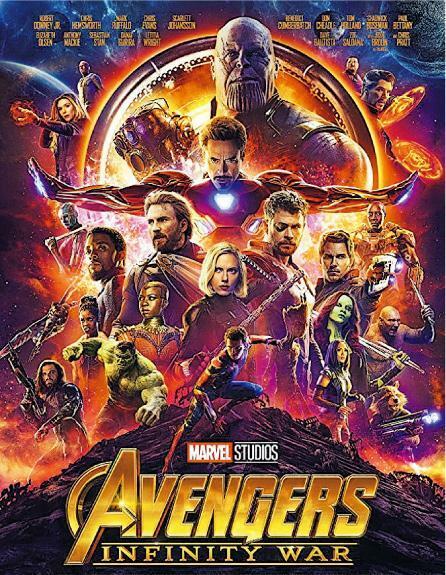 Its single day opening box office was HK$ 10,371,539, breaking AVENGERS: AGE OF ULTRON's opening day record of HK$ 9,616,749 to become the opening day box office champion in Hong Kong history. 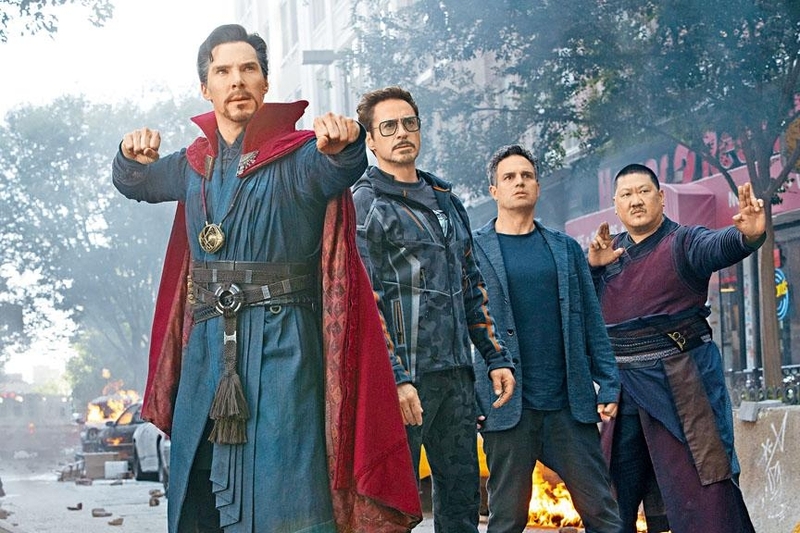 In addition, AVENGERS 3 yesterday took up 93% of all of Hong Kong's box office; AVENGERS 3 yesterday had 91,779 viewers, 88% of the entire Hong Kong cinema admission rate and would likely become this year's number one film. [2018.04.26] NICK CHEUNG ARRANGES FOR MAGGIE CHEUNG HO YEE TO PLAY A "MALE ROLE"
The Nick Cheung Ka Fai directed crime action film THE TROUGH (DAI NGAK CHO) will open soon. Ka Fai and one of the actresses Maggie Cheung Ho Yee yesterday arrived in Guangzhou and Dongguan to promote. Cheung Ka Fa and Cheung Ho Yee spoke to the media about the production. Two friends of many years were full of chemistry, making people look forward to their exciting acting in the film. Ka Fai and Ho Yee had a very friendly exchange with the audience and the media in Cantonese. Hong Kong film and Hong Kong series viewers were no strangers to the team of Cheung Ka Fai and Cheung Ho Yee, as they starred in Hong Kong series like UPS AND DOWNS IN THE SEA OF LOVE and A SMILING GHOST STORY. In the former they even played happy rivals. The audience looked forward to Cheung Ho Yee's performance in THE TROUGH very much. Cheung Ka Fai recalled his original intention. "Cheung Ho Yee's character generally would be a role for an actor. Because I am relatively rebellious, I felt that an actress could play this character. I always feel that Cheung Ho Yee is a great actress, very mild mannered, very suitable for my upside down creative concept." Cheung Ho Yee was asked how she would grade Cheung Ka Fai the director and Cheung Ka Fai the actor. She gave a very objective reply. "I have known Cheung Ka Fai as an actor. After all this time he has completely matured and jumped out of the actor frame. He is very sensitive and attentive to an actor's performance. I have nothing but praise for both identities." SHED SKIN PAPA (TUEN PEI BA BA) will open on May 10th in Hong Kong. Best Actor Louis Koo Tin Lok played the lead. Golden Horse Best Actor Francis Ng Chun Yun played his father. This character went from age 79 to 19. Crossing six eras relied not only on Ng Chun Yu's superb acting but also special effect make up. As everyone knows Ng Chun Yu is a very serious actor and would make a lot of preparation for the character. In order to play the elderly father, when the production began at 10AM Ng Chun Yu would arrive at 5AM for special effect make up -- including a skull cap and fake skins glued to his face. 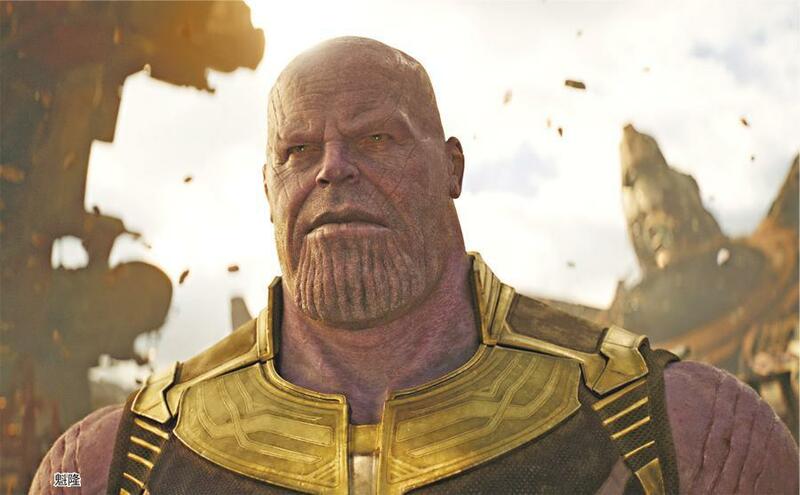 With the make up artists' masterful skills, wrinkles and sagging skin effects were added to bring this elderly papa to life. 2017. An old man being treated in a hospital is always clinging to what appears to be a screenplay for a film. When a young nurse, Amane, asks him, "What’s it about?" he bashfully begins to tell the story. "It's a magical tale of a young man..."
1960. Kenji Makino is an Assistant Director at a film studio. He dreams of one day becoming a director, but all he does now is run errands. Kenji's outlet and secret pleasure is watching his favorite old romantic movie at the theater -- an old black & white treasure that only showed for a brief period before being cancelled. The film’s heroine, a princess named Miyuki, was the love of his life. One day, the director of the movie calls and says he wants to buy the old reel of film. The owner of the theater agrees to sell it, despite Kenji's protests. "This will be the last showing..."
But then something miraculous happens. Following a clap of thunder, the heroine of the movie literally jumps off the screen...in black and white! She’s breathtakingly beautiful and equally strong-willed, just like Princess Miyuki in the film! Miyuki is mesmerized by the colorful world she has landed in, but causes nothing but trouble for Kenji. After a night of fierce argument, Wong Kim Far’s husband left her. Wong was left alone to take care of her mentally challenged autistic son. She was thinking to commit suicide but found out her husband was living happily with his mistress. Wong planned a series of secret action to regain the integrity of the family. However, her friend advised her to live a positive life is a better way of revenge. When Wong was struggling and right before she lost here mind, she found out her son actually understand completely the pain she’s going through. He begged Wong not to do anything stupid. Wong was finally relieved and returned to her peaceful life with her precious son. 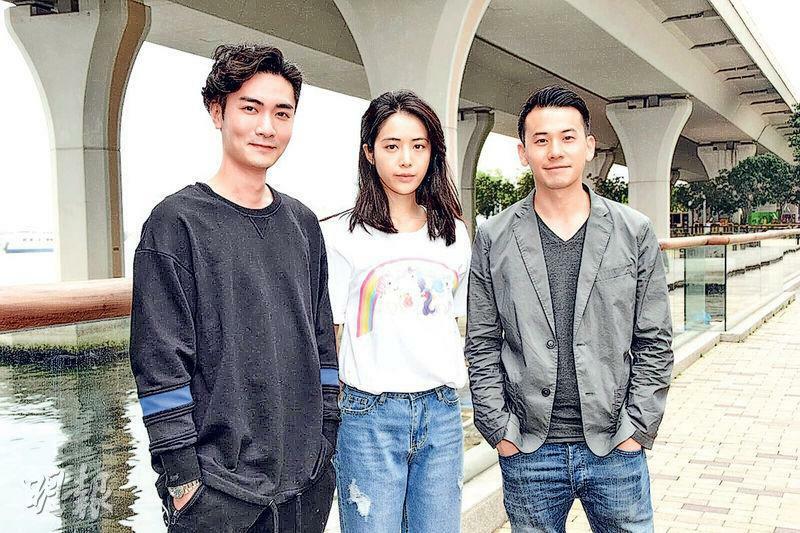 The golden team of Alan Mak Siu Fa and Felix Chong Man Keung teamed up again for the Emperor Motion Picture series INTEGRITY (LIM JING FUNG WON). The trilogy will be YIN MOK (SMOKE SCREEN), HAK MOK (DARK PLOT) and NOI MOK (INSIDE STORY). The opening shot YIN MOK starred Best Actors and Best Actress Sean Lau Ching Wan, Nick Cheung Ka Fai and Karena Lam Ka Yun. The cast also included Alex Fong Chung Shun, Carlos Chan Ka Lok, Kathy Yuen (Tong Y) and special guest star Anita Yuen Wing Yee. Emperor Group chief Albert Yeung Sau Sing even visited the set personally to cheer the team on. Very friendly with Mr. Yeung, Ka Fai immediately stood out and seek benefit for the team. Finally he successfully landed a five figure treat budget for the entire team. Ching Wan and Ka Fai worked together again after THE WHITE STORM (SO DUK). On the first day of work they began to "fight" as soon as they got together. Ka Fai joked, "I am very honored, as soon as we took our marks we had to fight -- in a game of pool!" Actually during their breaks they would play at the pool hall. Ching Wan and Ka Fai had a conversation at a pool hall in INTEGRITY. Thus when they were not working on a scene, they "fought". Ching Wan said, "I have always played." On and off screen they had to compete, because Ching Wan and Ka Fai this time would be around Lam Ka Yun. Ka Fai said that in the film Ka Yun was Ching Wan's wife. "Ka Yun once played my childhood mother, this time she would only arrest me. Thus we had more involvement during the capture." 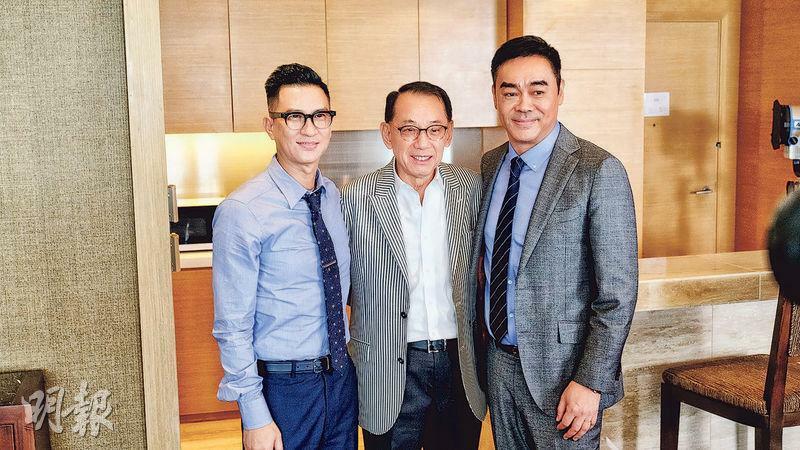 Later Ka Fai and Ka Yun will even shoot a snow scene overseas. Ching Wan lamented, "He has more scenes with my on screen wife Lam Ka Yun than I do." Aside from Ka Yun, Ching Wan also had another co-star that the audience would look forward to -- Yuen Wing Yee. Ching wan said, "Len Len is the actress I have worked with the most. We really haven't worked together in a long time. Before the shoot I ran into her family on the street. Later I learned that we would work together this time." In addition, to prepare for the ICAC character, Ching Wan revealed that director Mak Su Fai prepared a lot of material for him to study and introduced some former ICAC personnel to Ching Wan in hopes of him being able to understand their work in depth and be fully prepared. As for Chan Ka Lok and Tong Yi, Tong Yi joked that she and Ka Lok have been waiting for years to play a couple but they were still waiting. 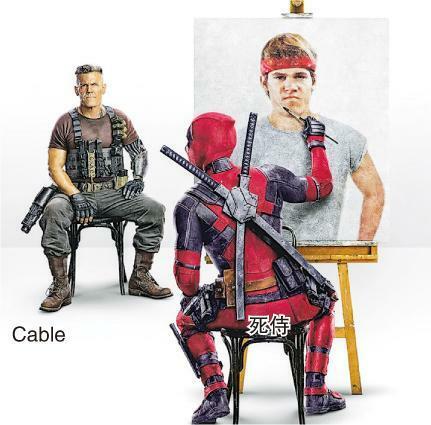 "This time we don't get to play a couple, but I added some ambiguous looks. I don't know if the director caught that. Haha." Playing Ching Wan's assistant, Chan Ka Lok said that he has seen Mak and Chong's OVERHEARD (SIT TING FUNG WON) film series. This time INTEGRITY also was related to the community. "This time we talk about problems that a smoke screen would create, a lot of people would certainly take notice. However what the problems are, I have to keep them secret because we are ICAC." Ka Lok would pay attention to changes in Ching Wan's acting in every shoot. "He adds more life to the entire thing, he is great." Tong Yi said that when she worked with elders, especially Best Actors, she would have stress. "Now I instead look forward to it. Maybe before I wouldn't dare to look at them directly, but this time I would overcome that." Teresa Mo Shun Kwan with the film TOMORROW IS ANOTHER DAY (WONG GUM FA) won the Best Actress Hong Kong Film Award. Two nights ago she, Best New Performer Ling Man Lung, boss Raymond Wong Pak Ming and Candy Yu On On attended the celebration. Best Actress Mo Mo admitted that she would occasionally raise her rates, but when she would run into good scripts the price would be flexible. Mo Shun Kwan tightly embraced her on screen son Ling Man Lung as soon as she saw him. He also hug his godmother Yu On On tightly for a photo. Mo Mo revealed that the day after the awards she already flew to Japan for a four day vacation. Because after her victory she was relaxed and had no pressure at all, every night she got drunk. "Actually I am quite a drinker, but I don't do it often. I was happy and relaxed so I drank more!" Mo Mo said that On On happened to be in Japan and arranged for a surprise party. She said, "We had champagne, whenever my glass was empty someone would fill it. It was always full. One night I didn't know how I got into bed. Every night I was drunk, luckily I just kept laughing!" Mo Mo said that when she woke up every day it would already be 2PM. Then she went out shopping. Although she did not go crazy, she still got something. Speaking of Yu On On's hope that she and god son Ling Man Lung would play mother and son in a film, Would Mo Mo be willing to guest star for them? Mo Mo said that definitely would not be a problem. Because they have already played mother and son on the stage, she definitely would support them on a big screen reunion. After winning Best Actress, has Mo Mo thought about a raise? Mo Mo said, "I haven't yet, I will read what the manager does. Actually occasionally I would raise my rate, but when I would run into good scripts the price would be flexible. However with some scripts that I don't really dislike, money would be more important." Yu On On's god son Ling Man Lung not only kept treating her to dinner after his award but also bought a new scarf for her. On On said, "I yelled at him, since he just started in film he shouldn't waste money!" Since winning Best New Performer, Man Lung had more film offers. On On also hoped that he would be able to play different types of characters. After playing a good son in TOMORROW IS ANOTHER DAY, now a director wants him to play a bad boy. Man Lung said that he never thought that he would play a CEO in a micro movie just now. 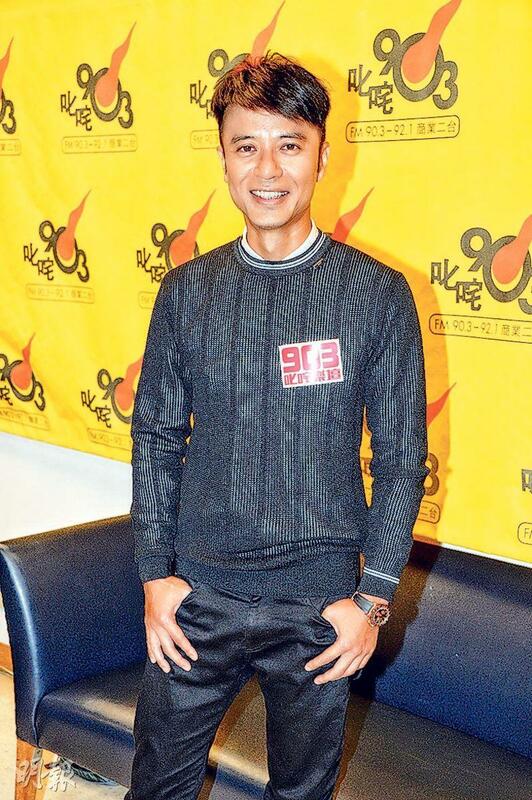 Hacken Lee Hak Kun yesterday promoted his new song SINGLE DOG on the radio. The song would be his only Cantonese song this year because in the second half of the year he would focus on his Mandarin record. Hacken also revealed that this year he originally would write and direct a film, but he fell behind schedule and had to postpone the production. He said that this film would be a more mature and a little humorous modern love story. 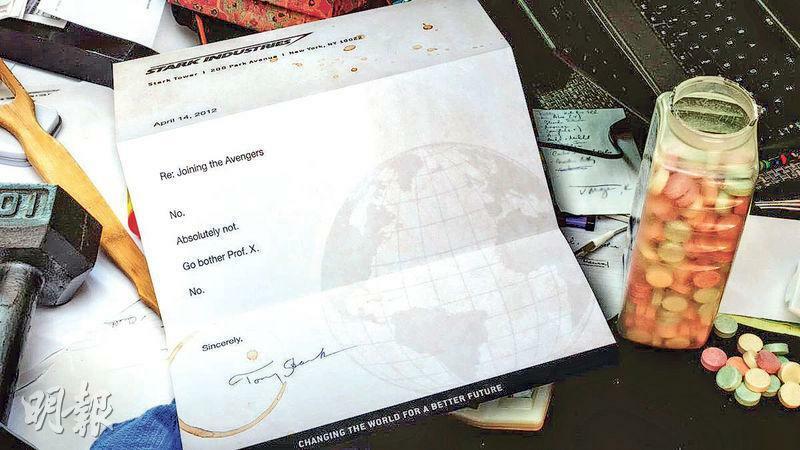 He already had a synopsis but he also wanted to find people of different levels to form a team and write a script. Would Hacken perform? 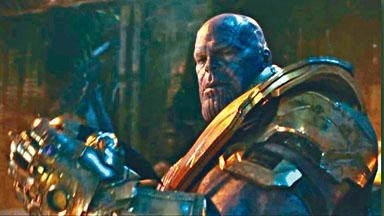 He joked that he did not want to affect the box office. "I am not going to act, how well can I act? If I can act well I would have won Best Actor! (Who would you like to cast?) Nothing is set yet, and it won't be a very large investment. Although the boss (Albert Yeung Sau Sing) said infinite funding, my goal is not to lose money. My first time as a director may be my last time, I hope to have a second time!"